For many homes, the conservatory is the extra space at the rear of the property that is well used at certain times of the year. But at other times of the year, it remains almost unused. This is often due to a combination of factors such as being hard to heat or difficult to cool. But if you are considering renovating your conservatory, how can you make the room more useful while you do it? As mentioned, the problem with conservatories come in the extremes of the year when it is coldest or warmest. The glazing and frames of the conservatory can play a big part in how energy efficient the room is. Conservatories don’t have the same requirements as other parts of the house because they don’t usually come under building regulations, but it is still an important area to consider. Double or triple glazing is worth considering if you want to use the conservatory all year round. This offers the heat retention to make the room warmer without blowing up your heating bills. And in the warmer months, if you are using some kind of cooling system, then the glazing can help keep the cool air inside. Or you can easily open many of the windows for maximum airflow. The final step in renovating your conservatory is the decoration. Because they don’t have much in the way of walls, there’s a lot less to decorating them than other rooms. But you can still paint solid wall areas and decorate where the conservatory meets the house. Consider decorating to fit the use of the room and to furnish in the same way. For example,if you plan to use it for a second living room then you might want blinds at the windows to block sunlight some of the time. The same might apply if it is a home office. Whatever you do, remember that dark colours absorb light so lighter shades are often the best for conservatories. One of the biggest problems with a conservatory is often the roof. Because it is made mostly of glass, it allows all the sunlight to flood in during the summer, which makes the room very hot. And in winter, it allows the heat to rise and vanish, meaning the room is often cold. So topof the list of things to consider for renovating the property is the roof. Many people are switching to a solid roof to make the room more useful. What option is best dependsa lot on the structural strength of the conservatory. 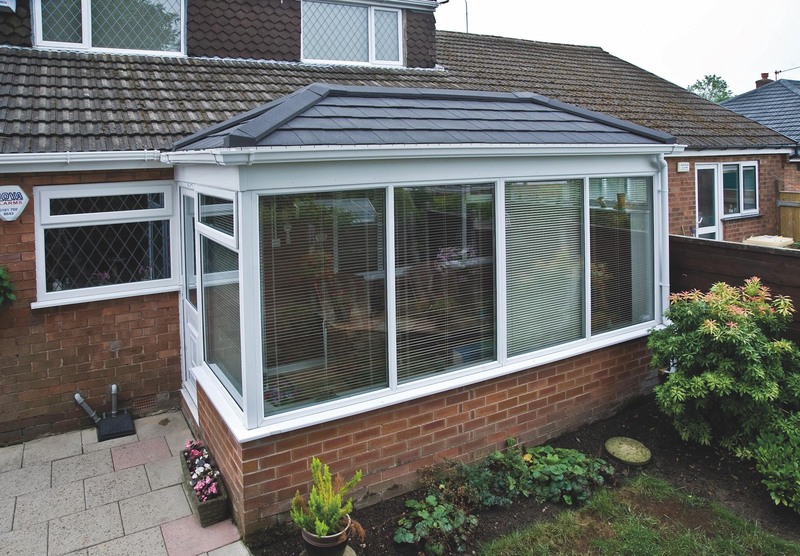 For example, it is rare that a conservatory is strong enough to support standard roofing tiles. You can look to add timber roof supports to make this possible, but this often spoils the look of the conservatory. The development of lightweight roof tiles has opened up many more opportunities when it comes to solid roofs for conservatories. Made of lightweight materials, these tiles don’t need the structural support of traditional roof tiles while still giving much the same benefits. Now that we’ve had a look at 3 of the most useful tips for renovating your conservatory choosing which one to go for depends completely on your circumstance. If you decide you want to add value to your property, as well providing a room that can be used all year round, then renovating your roof with lightweight roofing tiles is by far the best option. For superior durability, there really is no better option than Europe’s no.1 lightweight steel roofing system. Lightweight steel roofing has evolved to become a product that offers benefits that exceed those of traditional roof tile materials. To find out more about getting a conservatory roofconversion, get in touch with Metrotile by calling us on 01249 658 514 or you can fill in our contact formand we’ll get back to you.